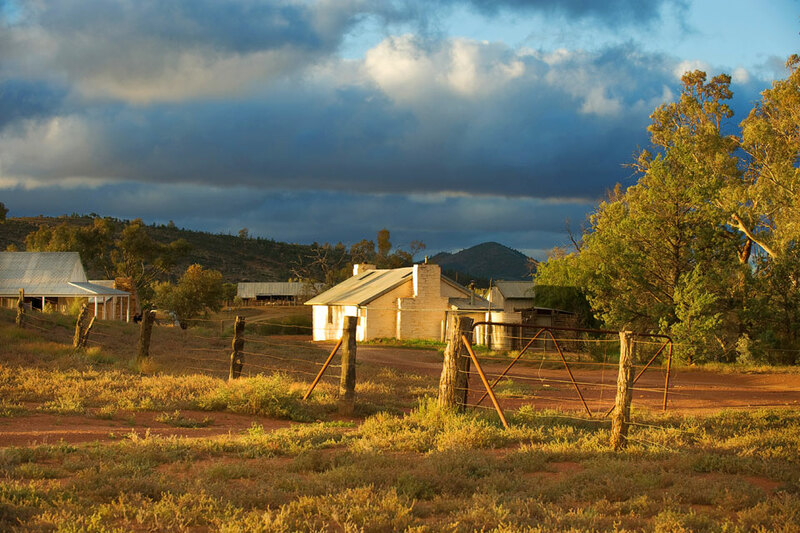 Angorichina Station is 500 square kilometers of mountains, creeks, gorges and hills in the central Flinders Ranges near the old copper mining town of Blinman. It is a working sheep station running merino sheep by 4th generation pastoralist Ian Fargher and his wife Di. Angorichina Station is ideally situated for those who want to explore the highlights of the surrounding mountain ranges. The area is thrilling for viewing the abundance of wildlife, 4WD enthusiasts, nature lovers, artists, photographers, history and geology buffs. At the peak of the Ranges, enjoy sun downers from a hill top, do a scenic flight with the station owner, or gaze at the stars by the open campfire. In this central location, the hiking trails are plentiful, wildlife abundant and geologically astounding. Chat to your fifth generation station owners for local knowledge to complete your outback experience. Just 9km from Blinman, stay at the well-equipped shearers quarters adjacent to the oldest native pine woolshed in Australia still being used for shearing. Angorichina Shearers Quarters (5 twin bedrooms, 1 Queen Room, 1 Bunkhouse with 4 beds). The original shearer’s quarters which date back to the 1850’s offer a glimpse of the past with modern fittings providing practical, comfortable accommodation ideal for families and groups wanting a private escape to get in touch with nature. Unpowered camping sites also available. Enjoy exclusive access to the ‘Oratunga Track’ for a 4WD’ing experience (only available to guests staying at Angorichina Station). 4WD, Hike, BBQ, Bird Watch, get involved in station activities (seasonal), relax or take a scenic flight with the station owner. We recommend a stay of at least 3 days to relax and experience a variety of activities in the area suitable for all ages. Stay with us and Fly the Flinders with us.